The Vigeland Museum is the sculpture museum of Oslo. Our responsibilites and ambitions are two-folded. 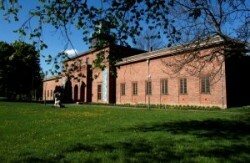 The Museum is dedicated to Gustav Vigeland. The main responsibilitiesis to take care of the heritage of Gustav Vigeland towards the public, and to preserve this for the coming generations. The majority of the Museum's exhibition space is a presentation of Vigeland's oeuvre. In addition to this, the Museum's ambition is to be the most interesting venue for presenting art within the three dimenional field. Since starting with temporary exhibitions on contemporary and modern art, the Museum has, over the recent years, become more focused on this specific kind of art, i.e. sculpture and installation, and video based art. The Museum puts an emphasis on presenting a variety of these artistic expressions, and striving to keep it on a high qualitative level. Tuesday - Sunday: 12.00 - 16.00. Tuesday - Sunday: 10.00 - 17.00. Closed: 1 January, Good Friday, Easter Sunday, 1 and 17 May, Christmas Eve, Christmas Day, New Year's Eve. Free entrance in the period 1 October 2008 - 31 March 2009! Students, seniors (+67), children (+7): NOK 25,-. Children under 7 years: free entrance. Groups (minimum ten persons): 25,-. The Vigeland Museum is situated south of the Vigeland Park (direction Skøyen), five minutes walk from the main gate in the park, along Halvdans Svartes gate (from Frogner Plass). Bus 20 or tram 12 to Frogner Plass. All westbound lines (T-bane) to Majorstuen station. By car, follow ring 2 to Nobels gate. The museums ground floor is accessible for disabled visitors. Parking: Parking lot with parking charge and street parking.